We crossed to Martinshaven at 0845 hours. I went in to Marloes for stores. A large number of Swallows were flying E. along Marloes peninsula. 2 Choughs near West Hook farm, Shirley saw a Buzzard over Martinshaven. We returned about 1030 hours, stocked up now for about a fortnight at least. Alfred returned today and brought a total of 38 visitors including two dogs and two tortoises (being carried in a box)!!!! Again people were grumbling that it wasn't worth coming just after 1300 hours and leaving at 1400 hours, he took the ones who landed first at 1500 hours, a most strange arrangement. P. Pearson landed 11 from his motor boat at Welsh Way, they left about 1630 hours, after one and boiled a kettle on the S.Haven driftwood beach. A yacht and 2 other motor launches came into S.Haven during the afternoon, no one landed though. Alfred brought Miss Havard Rae Jones and one female to stay the night at the chalets, he has gone back to Milford, after arranging for the Edwards to call tomorrow for the two visitors. He obviously doesn't intend to come tomorrow, good or bad weather, although he knows full well that there are people due for the chalets. Most unreliable, thank god and the W.W.F.S. that we have a boat and are entirely independent of Alfred. Owing to interruption with boats I could only skin and dissect 7 today. Maria Gill arrived at the beginning of May to work for two months as a Long Term Volunteer. We soon discovered she is a talented artist and that’s how it all began! Having visited the two public bird hides on Skomer Maria suggested brightening them up with some very useful bird identification boards. We sorted her out with some paints and brushes and she found herself some suitable plywood boards to use. 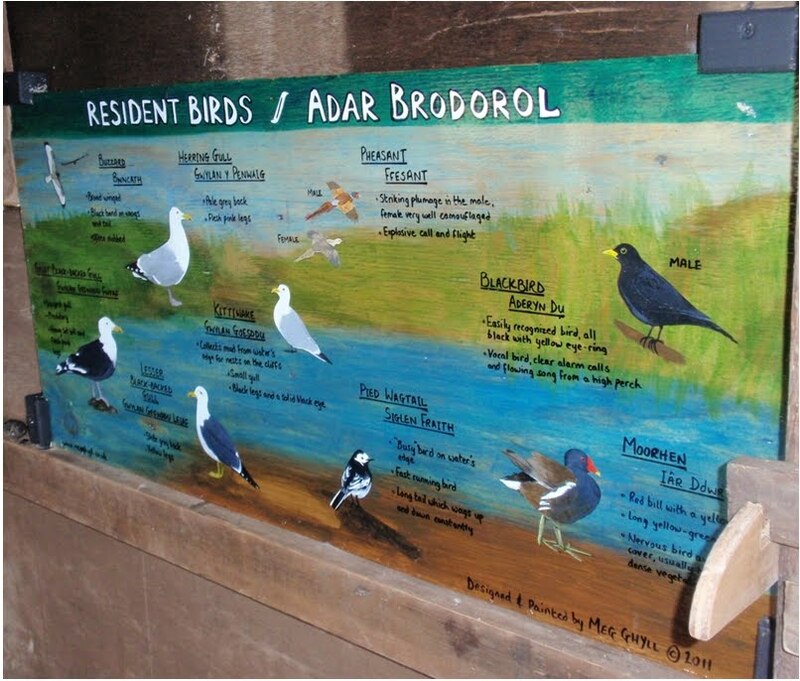 Some of our wonderful volunteers sanded them down and Maria got to work designing the boards. With the locations in mind, Maria carefully selected the species which frequently visited North Pond and Moorey Mere. Work progressed quickly once the boards had the templates pencilled on them. It was great to pop into Marias kitchen and see the boards develop into beautiful scenes. The birds were painted with their identifying features on show and words accompany every bird highlighting these key features. They have certainly brightened up the bird hides and I am sure they are used frequently by everyone who visits the islands hides. 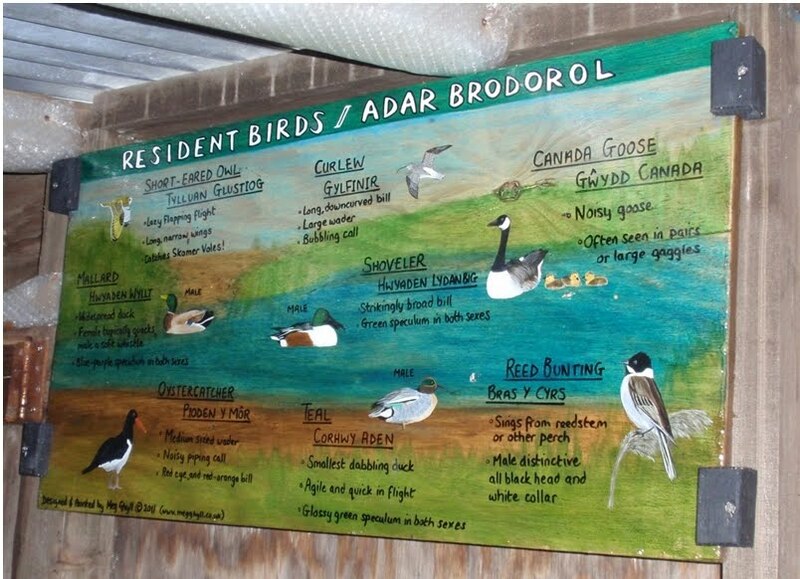 Having recently seen the feedback forms from our overnight guests I have discovered just how much identification boards were sought after in the bird hides! So it’s great to have them up on display now. Thank you very much Maria! We love them.